An aircraft operated by Nigeria's largest airline, Arik Air, made an emergency landing on Tuesday when the pilot detected smoke in the cabin. The aircraft, travelling from Lagos to Accra, Ghana, had smoke coming from its cabin many miles away from its destination in Ghana. A passenger had taken to the social media Thursday complaining about alleged ill treatment meted out to the affected passengers on the flight when the plane eventually landed in Ghana after the experience. But the airline said in a statement on Thurday that there was no incident and that passengers disembarked without hitches. The airline's spokesperson, Adebanji Ola, said the captain briefed the passengers when the incident occurred. "Arik Air flight W3 304 from Lagos to Accra on March 6, 2018 declared an emergency in line with standard operating procedures, when unknown source of smoke was detected in the cabin 81 miles from Accra," the statement said. "The captain of the flight briefed the passengers accordingly, assuring them that the aircraft was under control and safe for landing in Accra. "The aircraft, a Dash 8 Q400, landed safely in Accra without further incident and all passengers disembarked normally." The incident occurred against the backdrop of series of near-mishaps recorded in the Nigerian aviation industry in recent weeks. In February, two separate incidents involving Dana aircraft in Abuja and Port Harcourt dominated the media space, with many calling on the government to pay serious attention to the aviation sector. Earlier, the runway of Akure airport was invaded by cows, delaying the landing of an aircraft for several minutes. The Nigerian government had Wednesday reacted to the Dana incidents when it ordered a complete audit of the airline's operations. 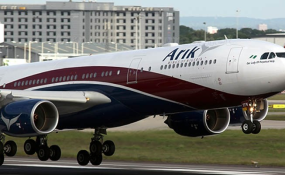 On Thursday, Arik airline said the malfunctioning aircraft is currently parked in Accra and its team of engineers were conducting comprehensive inspections on it. The team would ascertain the cause of the smoke, it said, after which the aircraft would be flown without passengers to a maintenance facility for recertification and testing. "The relevant aviation authorities in Ghana and Nigeria have been briefed appropriately on the incident," the statement said.